School year 21015-2016 is officially over! June 28th, 2016 marked the end of the school year for NYC public school students. It was a wonderful school year filled with many memories and lasting connections in our community. We’re so proud of all of our students and extend our gratitude to our teachers, staff and families for helping nurture and grow our students potential. Here is a look back at some of the great things our community did this year! (March 5, 2016) The Middle School Principals’ Association of the City of New York Educational Leadership Conference was held on Saturday, March 5th. Cavallaro’s 8th Grade Assistant Principal, Mark Hayden, was honored for his efforts in making a difference in the educational lives of Cavallaro students. The Administration at Joseph B. Cavallaro supports, guides, instructs, and encourages achievement in all children. Mr. Hayden was recognized for his exceptional leadership, as well as the role he plays in the day-to-day operations of I.S. 281 . He instills pride in his students and supports children in developing a lifelong love of learning. (May 20, 2016) Congratulations to one of 288’s brightest academic all-star team members and middle school senate member for winning first place in the Middle School spelling bee.We are so proud of this young scholar for being a leader, positive role model and the picture of excellence at 288. PS 101 The Verrazano The 2016 Annual Dance Festival: Dance Craze!!! PS 101 Early Childhood Students participate in this amazing event every year. PS 253- In an effort to ensure that their students continue to recognize the value of higher education they use College Awareness Day to “zoom in “ on their students personal aspirations about college and the colleges that they thought might best fit their needs. This month the students are working on Informational writing they were able to see the real world value of the genre they had been learning so much about. (March 2016) 288’s Parent vs. Faculty basketball game was a great success. The game was exciting, fun and their parents and faculty showed that they are truly a family at 288. It was so great to see their scholars who made banners to cheer on their fathers. 288 is a special place because they are working so hard together to make it an amazing place for their scholars and the community. (June 2016) P.S. 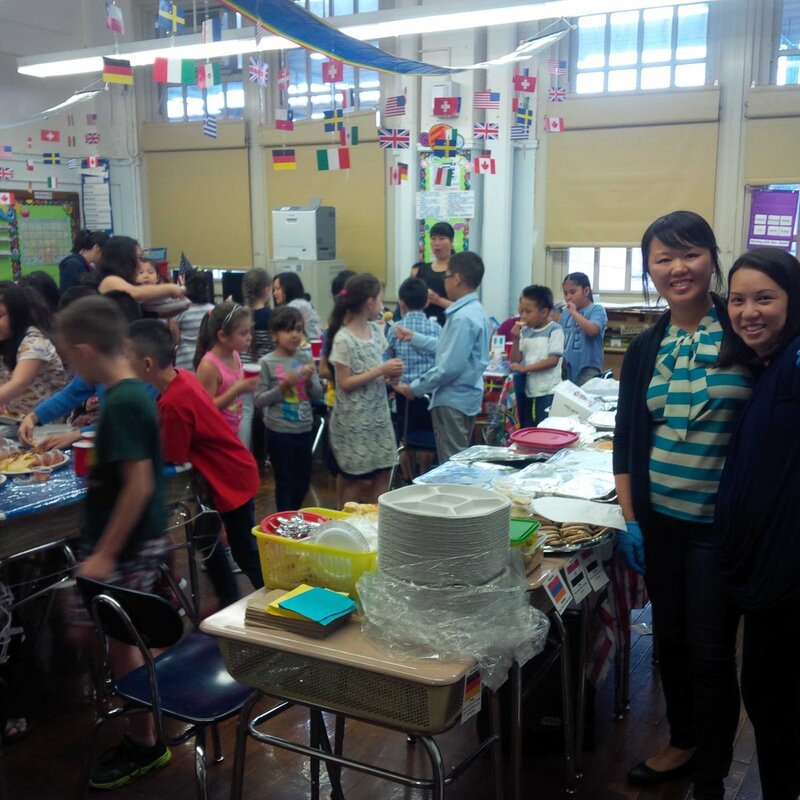 101 Ms. Li ans Ms Rivera host a Cultural Event for students and parents. (January 2016) I.S. 98 Bay Academy Parent Coordinator Caryn DiMari did a wonderful job in creating a fun and creative way to bring parents together. With the help of Art teachers Molly McGrath and Meredith Samuelson Parent Paint Night was a huge success. They did a wonderful job helping attendees create master pieces. Parents learned the positive impact the arts have on student’s education.Thank you to the PTA for supporting this event. (May, 2016) P.S. 215 finished the regular season undefeated and were victorious over P.S. 288 for the District 21 championship. In honor of their dedication each individual member of the traveling basketball team received a trophy. The students learned important skills needed to participate in a team sport. They learned about teamwork, hard work and dedication among countless other skills they can incorporate in their lives on and off the basketball court. Second graders at PS/IS 288 are taking their health and fitness to the next level. On May 13, 2016 they began their first of 10 swimming sessions at the Coney Island YMCA. PS/IS 288 continues to extend their scholars learning opportunities outside of the four walls of our classroom. (December 2015) Sixth graders take an exploratory elective covering zoology, physician’s assistant training and robotics, and then choose one to focus on for seventh and eighth grade. Ideally, if students decide to pursue an interest in animals, the knowledge they gain in zoology will help them get into Abraham Lincoln High School’s veterinary science program, said Fiume. The class learns about animal behavior patterns, anatomy and how they survive. Students witness birth and death, developing a greater understanding of the life cycle by seeing it first-hand. (January 2016) The IS 228 Art Magnet students captured the 1st Place and 3rd Place awards in the 31st Annual Dr. Martin Luther King Essay, Poetry and Art Contests. Sponsored by the Central Brooklyn Martin Luther King Commission. Congratulations to their Art Director – Mrs. Lisa Banker for making a difference everyday @ Boody! (March 2016) PS 100’s Ballroom Team getting ready to take the floor. Their 4th graders, are participating in The Dancing Classrooms program from the American Ballroom Theater. The American Ballroom Theater works students and Teachers, for 12 weeks to learn the Rumba, Foxtrot, Swing, Tango and more! At the end of the 12 weeks, they go into a competition with other schools who are in the same 12 week cycle. Teams are awarded bronze, silver and gold medals and the gold medal winners go onto compete against other gold medal winners! Schools across NYC are using the 40 minutes creatively to engage families and support student learning. Here are some of the activities already underway In District 21. P.S. 153 – Book Making Tuesday. P.S. 215 – First grade, students, parents, grandparents, and siblings chose materials to create an art project representing their version of a tree.Families also explored the art and science of cooking Mediterranean Style using fresh ingredients such as tomatoes, garlic, basil and olive oil. They discovered how easy and delicious it is to make their own fresh tomato sauce.The hands-on lesson turned their participants into chefs while enjoying a wonderful time together.